Members of the Barbados Junior Squash Team, coach Rhett Cumberbatch (left, rear) and team manager Katherine Stewart (right) will be heading to Guyana on Friday to compete in the Caribbean Area Squash Association Tournament. 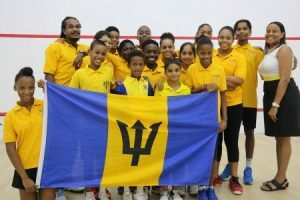 The Barbados Junior Squash team is looking to improve on last year’s performance at the Junior Caribbean Area Squash Association (CASA) Squash Championships and is confident of bringing home gold medals in all divisions this time around. A contingent of 19 players will travel to Guyana on Friday June 30th to compete in the week-long tournament at which Barbados is expected to perform well. They won six individual gold medals last year, the most ever by a Barbadian junior team, and the girls’ team will be defending their team title for the second year in succession. Speaking at the Barbados Squash Association today, national junior team coach Rhett Cumberbatch told the media the team was well prepared this year to make a clean sweep. “We put in a lot of work in training, we’ve been training hard since early February, training consistently straight through. This year our plan is to go for gold in both the boys and girls team events. The girls are the defending champions for the last two years and we want to maintain that. The boys had a tough draw last year, came third but we are looking for gold this year. That is the plan,” Cumberbatch said. He added that their biggest rivals would be host nation Guyana but he believed it was Barbados’ time to shine. “Based on the seedings in the individual competition, we are going in with a pretty strong team, we are the ones to watch and Guyana have been saying it in their media too. We are definitely ready this year, we last won the overall title 12 years ago when I was playing on the junior team, so this year is ours! We put in the work and we are ready. This is our year. “Certain players are expected to win and the rest are toss ups. The toss up games, we will work our strategies based on what we see against the opponents to come out on top. We have done a lot of fitness work and it’s all on the day. But I think we have the stronger team , I think we look stronger than Guyana this year,” Cumberbatch said. He added that this team was more united than previous squads. “This team looks like the team we had before, (comradeship), training wise, I think the squash itself fell apart a bit. This team is a developing one that will be strong now and for the next couple of years. We have leaders who are inspiring the young ones to win and setting good examples,” he said. Girls team captain Amanda Haywood told Barbados TODAY the team was poised for success in the upcoming tournament and they had high aspirations. “Our team has been training very hard, since last year we never stopped training. We came together as a team, therefore since we have been training that long it has been paying off and growing together is also important as a team. Nine-year-old Arman Suleman is the baby on the team and said that although he felt anxious he was ready to give his best for his country. “I feel nervous, it took a long time for me to get into it, I’ve been playing games with my coach every day and it’s been hard playing, I expect to do my hardest.” He said.